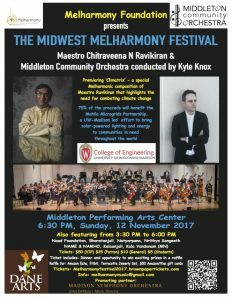 Come revel in the musical excellence of Maestro Chitraveena N. Ravikiran & Middleton Community Orchestra, conducted by Kyle Knox, as they premiere “Climatrax,” a special Melharmonic composition of Maestro Ravikiran that highlights the need for combating climate change. 75% of the proceeds will benefit the Mahila Microgrids Partnership, a UW-Madison led effort to bring solar-powered lighting and energy to communities in need throughout the world. In addition, it is a fundraiser for a GHI community-based research and outreach project in India for developing Sustainable Microgrids which aims to improve women’s health. GHI Director Jonathan Patz plans to give opening remarks.